Want to start running but don’t know where to begin? Global award-winning running brand Saucony is giving you the chance to go on your first run with their esteemed athletes through the brand’s Start Running initiative. It aims to encourage people to jumpstart their running goals through an unforgettable running experience with good performance gear like Saucony’s award-winning shoes and credible running influencers like celebrity athlete Matteo Guidicelli, who is slated to do a sports show soon. As part of Saucony’s initiative to inspire more people to try and start running, he revealed that he never really liked running when he first started. “I used to run before when I was a racer but on a treadmill. I never really enjoyed running outdoors or running long. I started enjoying and loving it when I started triathlon 5 to 6 years ago,” he noted. Ready to run? Here’s how! You can automatically get one raffle coupon to a running experience with Matteo and Saucony You’re your Strong shirts when you buy a pair of regular-priced Saucony footwear until September 22, 2016 from the participating department stores: SM Makati, SM Mall of Asia, SM Megamall, SM North EDSA, SM Cubao, SM Fairview, SM Manila, and SM San Lazaro. Excited yet? You should be! Visit Saucony at participating SM department stores and be on your way to a surely unforgettable first run! Tirelessly devoted to inspiring every runner, on every run, on every day, Saucony is an award-winning global running lifestyle brand that fuses performance, innovation and style to create the world’s most compelling footwear and apparel. Founded two years after the first Olympic Marathon, and one year after the first Boston Marathon, Saucony’s 100-year running heritage along with its “Find Your Strong” mantra showcases the brand’s commitment to continuously empower people to push themselves to be stronger and better in everything they do. Since 1898, the brand demonstrates deep respect for its authentic running heritage and its dedication to push the boundaries of running technology with its award-winning innovations, including EVERUN™, ISOFIT™, PWRGRID+™, Geometry of Strong™, and Total Run System™ apparel line. 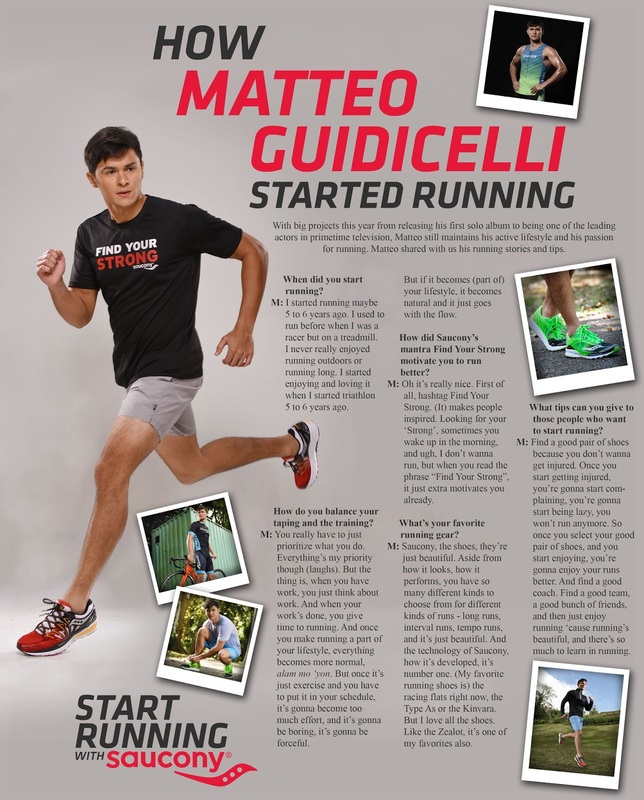 With big projects this year from releasing his first solo album to being one of the leading actors in primetime television, Matteo still maintains his active lifestyle and his passion for running. Matteo shared with us his running stories and tips. M: I started running maybe 5 to 6 years ago. I used to run before when I was a racer but on a treadmill. I never really enjoyed running outdoors or running long. I started enjoying and loving it when I started triathlon 5 to 6 years ago. Q: How do you balance your taping and the training? M: You really have to just prioritize what you do. Everything’s my priority though (laughs). But the thing is, when you have work, you just think about work. And when your work’s done, you give time to running. And once you make running a part of your lifestyle, everything becomes more normal, alam mo yon. But once it’s just exercise and you have to put it in your schedule, it’s gonna become too much effort, and it’s gonna be boring, it’s gonna be forceful. But if it becomes (part of) your lifestyle, it becomes natural and it just goes with the flow. Q: How did Saucony’s mantra Find Your Strong motivate you to run better? M: Oh it’s really nice. First of all, hashtag Find Your Strong. (It) makes people inspired. Looking for your ‘Strong’, sometimes you wake up in the morning, and ugh, I don’t wanna run, but when you read the phrase “Find Your Strong”, it just extra motivates you already. Q: What’s your favorite running gear? M: Saucony, the shoes, they’re just beautiful. Aside from how it looks, how it performs, you have so many different kinds to choose from for different kinds of runs, long runs, interval runs, tempo runs. And the technology of Saucony, how it’s developed, it’s number one. (My favorite running shoes is) the racing flats right now, the Type As or the Kinvara. But I love all the shoes. Like the Zealot, it’s one of my favorites also. Q: What tips can you give to those people who want to start running? M: Find a good pair of shoes because you don’t wanna get injured. Once you start getting injured, you’re gonna start complaining, you’re gonna start being lazy, you won’t run anymore. So once you select your good pair of shoes, and you start enjoying, you’re gonna enjoy your runs better. And find a good coach. Find a good team, a good bunch of friends, and then just enjoy running ‘cause running’s beautiful, and there’s so much to learn in running. To register, customer must complete the details in the raffle coupon. Upon completion of the coupon, the customer must drop the entry to the designated drop box located at the Saucony area in the participating SM department stores. Eight (8) winners will win a running experience with Saucony Ambassador Matteo Guidicelli and one hundred (100) winners will win Saucony Find Your Strong shirts. Deadline of submission of entries is until September 22, 2016. Employees of Saucony and participating stores including their relatives up to second degree of consanguinity or affinity are disqualified from joining the promo. Internal raffle draw will be done on September 28, 2016 at the SAUCONY MAIN OFFICE, 5:00PM in the presence of a DTI representative. Winners will be notified through registered mail and phone call by an official Saucony representative. Redemption period of the Find Your Strong dri-fit shirt prize is 60 days from the receipt of notification. Failure to do so would result to forfeiture of prize with prior DTI approval. If a customer wins both the Find Your Strong dri-fit shirt prize and the Running Experience with Matteo Guidicelli, the customer gets the bigger prize which is the Running Experience with Matteo Guidicelli. A customer may win multiple times in the Find Your Strong shirt raffle. Winners may redeem their prize at the SAUCONY Main Office. Prize is transferable but not convertible to cash. Winners will cover the 20% tax for the prize exceeding P10,000. *With prior notice, the date of the running experience with Matteo Guidicelli may change due to unforeseen circumstances like sudden changes in Matteo Guidicelli’s schedule.